Flexitec offers vinyl flooring to coordinate with any interior design. Their extensive range of choices gives you unmatched design posibilities. Our wide assortment of cushioned vinyl flooring comes in an incedible array of colors and patterns to suit the style of any room in your house. Whether you are looking for a traditional, classic or contemporary style, whether you want flooring for a large or small room, a comfortable bathroom or an inviting hallway, Flexitec can make it happen. The construction of your vinyl floor largely determins its durability and how well it will resist scuffs, scrapes, and stains while retaining its original luster. Flexitec has a unique structural composition allowing you to select a floor type that will match your personal performance requirements. At its core, Flexitec vinyl has a highly resilient fiberglass base, double encapsulated by pvc layers. Thanks to this revolutionary construction, your floor has unmatched deminsional stability eliminating conventional problems of contraction, expansion, curling and cracking, resulting in easy installation and higher durability. The unique characteristics of pvc gives you higher underfoot comfortand unparalled flexibility combined with excellent resistance to everyday wear and tear. COMFORT FOAM: Comfort Foam is a luxurious cushioned vinyl backing supporting the vinyl structure and offering a base for the indentation resistance. This backing reduces impact noise and sound transmission while guaranteeing unmatched underfoot comfort. The natural moisture-stop characteristics of pvc provide superior resistance to mold and mildew. FIBERGLASS: The fiberglass layer combines strength with flexibility, ensuring and easy and trouble-free installation process. This inter-layer offers your floor a unique dimensional stability, which means that it will not contract, expand, crack or curl. FOAM LAYER: On top of the fiberglass layer comes a cushioned vinyl foam layer, allowing additional indentation recovery thanks to its resilient nature. QUICK CLEAN WEARLAYER: The wearlayer determins the actual wear performance of your floor. The higher the wearlayer the more durable your floor. The wearlayer will give your floor its protection and resistance against general wear, dents, cuts and scratches, while retaining its lasting finish. The unique Quick Clean benifit offers you extra durability and better definition of design and color, ensuring a long-lasting luster and beauty for your floor. 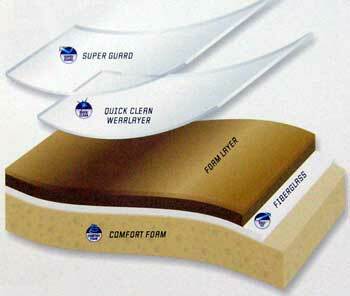 SUPER GUARD: The Super Guard finish offers you even better protection. This advanced, urethane-layer- resists scuffs, scrapes and stains and the accumulation of dirt and grime. This will allow your floor to retain its new look and ensure easy cleaning and maintenance. Need Help Installing Your Flexitec Vinyl Flooring?